A decision has been taken to stop dealing with Kubex products. Why? A walk in bath makes bath time something to look forward to. You can feel complete confidence once you close the unique multi-sealed door. There is no fear of any water leaks and when you have finished bathing the twin waste outlets drain away the water in a matter of seconds. 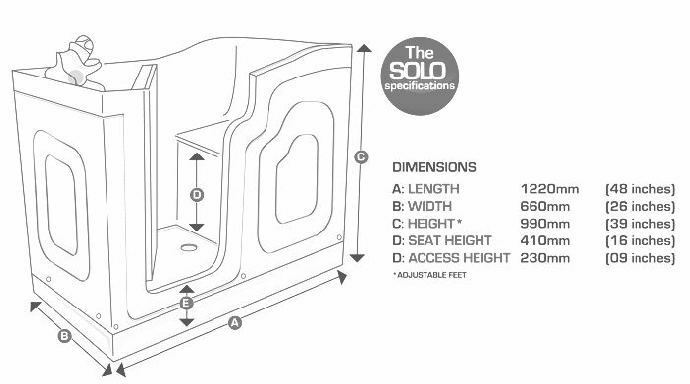 Being compact in size the 'SOLO bath' will easily replace the conventional type of bath freeing up useable floor space in the bathroom. Excellent access to plumbing ensures installation is simple and can be completed in the minimum amount of time. (with the hydrotherapy option) as a massage pool. A Massive 5 year guarantee! We don't know of another walk in bath to match it! Step in without assistance through the inward opening door - the low access and reassuring anti slip floor gives total confidence. Being taller the bath provides excellent purchase for support during entry and exit - something only a walk in bath of this 'tub' type can offer. Buy this product without paying VAT. You can choose exactly what you buy when you purchase a Solo walk in bath. If you simply require a 'bare bath' then please don't hesitate. But we have various optional additions at advantageous package prices that will complete your installation. Take for example the brassware. 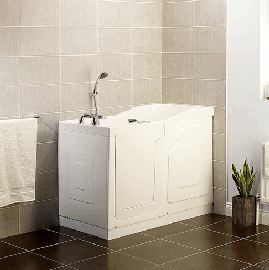 While you can supply and fit your own, why not consider the Venice bath mixer (pictured Left)? This neat and easy to operate unit offers thermostatic control to ensure no nasty surprises or variations in temperature during use. The Venice can also operate as a thermostatic bath shower mixer by simply adding the Venice shower kit (pictured right). Add a shower curtain to your Solo walk in bath and you have a convenient shower enclosure. The made-to-measure shower curtain and rail kit (left) helps you maximise your enjoyment of this simply wonderful bath. 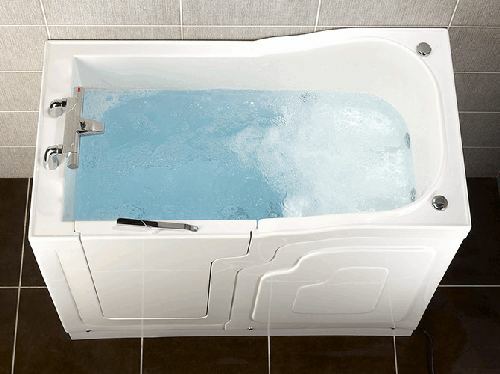 Enjoy the option of the whirlpool system on your walk in bath. The simple to use variable flow jets allow you individual control of both strength and direction giving you the pleasure and healthy feeling of a real water hydrotherapy massage. It is important to protect the user from the risk of scalding. 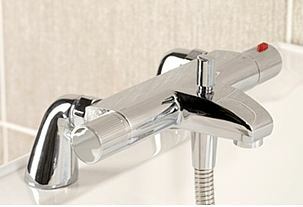 You should use an approved thermostatic temperature controlled tap and/or shower mixer system with this product. The Venice thermostatic bath mixer mention above is so approved. You can however add any brassware of your choice (including non-thermostatic equipment) providing you incorporate a thermostatic mixing valve (TMV) in the supply pipework to the taps. A TMV will ensure only water at a safe temperature can reach the bath, hence avoiding the risk of injury and scalding. Advice on suitable equipment is available upon request and we can supply any type of brassware together with thermostatic protection as required. NEVER use a walk in bath without suitable protection from scalding. To do so is highly dangerous. If you would like assistance choosing a suitable TMV (Thermostatic Mixing Valve) or brassware for your bath please don't hesitate to ask. We are only too pleased to lend assistance.